This is what I see when I walk downtown along the Hudson River. 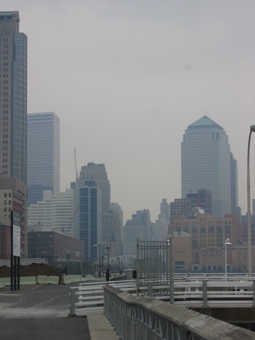 The World Trade Center used to be in there somewhere, but for the life of me, I cannot remember just where the towers stood. If you look at the tallest building on the left, the next tallest building immediately to the right of that is the first new building on the site, so somewhere near there. I shot this today, while walking downtown to see Catch and Release, which was so sweet. I recommend it for a nice escape. Except I wanted Kevin Smith to get the girl. He’s so cute and charming. Who can not love Kevin Smith, I ask you?? Only someone really messed up, I say. I was going to stay and also see Children of Men, but the movie times listed online were wrong, and I didn’t want to wait an hour. So, I’m back home, and maybe I will now work. Except, Howard has my next chapter and he said such great things about it I’m on cloud 9. Maybe I will wallow on cloud 9 for a while. Do see Children of Men. It’s a bit grim, and the suspension of belief factor is high, but it’s really quite good and the sets (many filled in later by computer graphics wizards)of London after an environmental apocalypse are fascinating. Certainly a lot better than ‘Dreamgirls’, which, I agree, was tedious, although I am glad that Jennifer Hudson got the part after being robbed in American Idol whenever that was…season 3?? BTW the cat blog “William of Mass Destruction” is really smart and fun if you haven’t seen it, although I am aware that none of us need yet another blog to check every day. William looks like Finney and is also very cheeky. Actually, I think I need more blogs to check into everyday, so thank you. I love a new blog to read! I’m going to see Children of Men today, hopefully. You convinced me. And yeah, I cannot freaking believe that Jennifer Hudson did not win American Idol. I’m fairly new to the show, I can’t remember if I’ve seen one season or two, so I missed her season (but now I am compltely hooked and will never miss again). What happened?? During the season that Hudson was a top ten finalist, she was voted off the show when there were still 7 contestants left. It was a shock, since she was so unbelievably much better than some of the ones who continued on. One theory was that since there were 3 really fabulous African American women as finalists that year, the vote was split that week. Anyway, it is interesting that the winner of AI that year, Fantasia, was beat out by Hudson in the Dreamgirl auditions. Oh, that’s a very interesting tidbit about Fantasia auditioning and not getting a part. And thanks for telling me what happened on American Idol. Because really, how many people on the planet sing as well as her? That very first song they do in Dreamgirls? It was the most exciting moment in the movie, hearing her sing for the first time. Did you get to see Children of Men today (actually yesterday)?